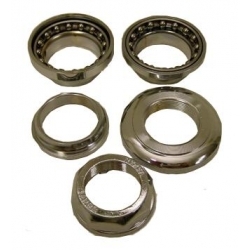 Complete basic quality headset including bearings, bearing races and weather seals with round ball bearings. For use with threaded steerer tubes and quill type stems. Made of chromed steel so has a traditional look. Please choose either 1" or 1 1/8th" depending on the diameter of your steerer tube. Most traditional bikes have 1" steerer tubes. This gives the diameter of the inside of the headset. The main reasons why parts like this fail are a lack of lubrication or being installed either too loose or too tight. Please make sure you use plenty of grease when installing and that it is installed so tight as possible while still rotating easily. If you can "feel" the rotation in steps then it is too tight. After installation, ride for a few days before tightening up a little more to get rid of any additional play which has developed. This headset is low cost, but will perform well if installed and lubricated correctly. We also sell other headsets with different quality levels and fittings.